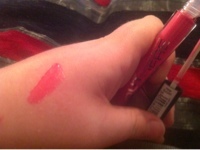 This stain/balm is so pigmented. 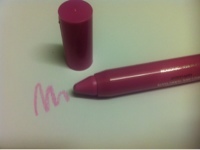 Its a gorgeous berry pink colour and feels glossy and smooth on the lips! The stain last for hours even though the sheen wears off. Remember that lip butter craze we had...people running around boots shoving as many as they could grab into their baskets...sold out all over the country?? 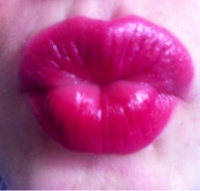 Well I expected the same fury over these kissable lip stain balm hybrids! Fear not my superdrug had a fair few around! And they dont seen to have has had much hype and weir seems we havnt had to wait an etirnity for them to arrive! I practically squealed when I saw them they are just so beautiful...i got 3 but was tempted by them all here Is the first 1...cherish! 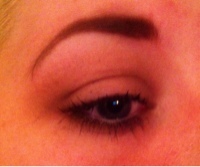 So far I love them but I haven't had them long...2 hours maybe! The texture is quite firm you have to build up a few layers they feel a little sticky at first but dry to an almost none existent layer! I tested it out and ate a sandwich...it's still there :D ! Sleek storm palette- the two matte brown shades on the lid the darkest one in the crease. I have not got a lot of sleek makeup I tend to stick to the brands I that and don't venture outside my comfort zone much...*snore* ! 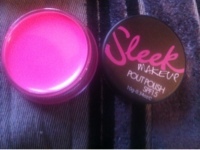 But I have heard nothing but good about the brand so I picked up this light bright pink lip conditioner! 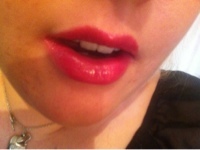 It's a gorgeous texture, not sticky on the lips but thick and creamy. 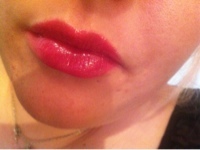 It isn't the most pigmented product however it gives just enough colour and is build able. It lasts well and moisturises beautifully! I have ears about these before and I am nt the biggest lipgloss fan I find they just make lips looks sticky and shiny and I prefer them to look matte or slightly sheeny...long story short! Anyway I was browsing superdrug and the colour of these looked so lovely and swatches they were so pigmented it was hard to choose 1 so unpicked up 2 but restraint kicked in and I managed to buy just one! I went for a bright pink, not as bright as some of the pinks they had. Anyway it's plumping so it's a little tingly but I quite like that effect. It doesn't feel sticky and is thick. 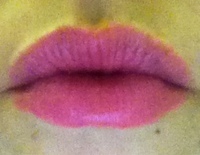 It's pretty close to a lipstick so itching that's why I get on so well with it. I did har to put a couple of thin coats of this to get a bright colour but it's one of the best, most pigmented glosses I have tried. Plus it's only £2! Just a heads up if you have blonde hair and want something to take out that brassy look then try this! Currently 3 for 2 on all hair care in boots it's a great time to give this a go. I lather it in my hair and leave it for a few minutes then rinse and condition. I have only used this a couple of times but if your blonde I think you can feel what I'm saying! You just KNOW!! 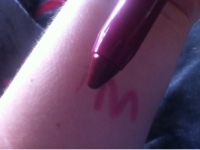 It's really highly pigmented purple and you only use it once a week so this huge bottle will last a lifetime! This is a toner for getting platinum hair! I coloured my hair from red to blonde around 2 months ago and i toned it within an inch of its life, still I wanted white hair! I understand you can't get from red to white straight away but this stuff is amazing!! My hair had a slightly yellow tinge and after bleaching my roots I wanted ofet that yellow out and white in!